Wouldn't want her to be an old maid, would we?? Their engagement in Syria after a whirlwind holiday romance could set an unenviable world record. Khalid, the would-be groom, is five. Hala, his fiancee, is a tot of three. Their parents, astonishingly, are not only taking the betrothal seriously – they even arranged the ceremony and bought the rings which the 'couple' exchanged as if they were adults. They say the playschool-aged pair consented to the match and are acting of their own free will, although they will not wed for another 10 years. 'We know Khalid or Hala might change their mind in the future, but what we do know at this stage is that they are very happy and talk to each other every day,' the boy's father, Juma, told Gulf News. The boy is said to have met and fallen in love with Hala while he was holidaying with his parents in Lattakia, on Syria's Mediterranean coast. Khalid was supposedly lovesick on his return home to Homs - a town about 100 miles north of Damascus, the Syrian capital - and refused to go back to his nursery unless Hala joined him. 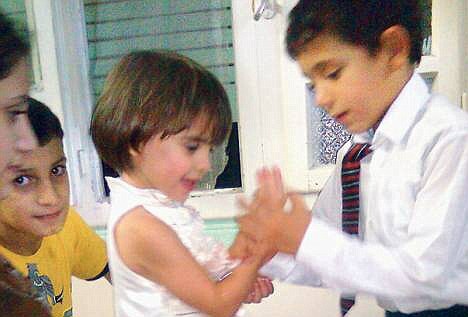 'Khalid told me and his mother that he would like to have stayed with Hala or bring her home to Homs,' Juma said. Instead of treating it as a case of premature puppy love or kindergarten role-playing, his parents called Hala's mother to seek her opinion. 'She said her daughter had developed similar symptoms of loneliness and the family would be very happy to see them engaged,' Juma continued. 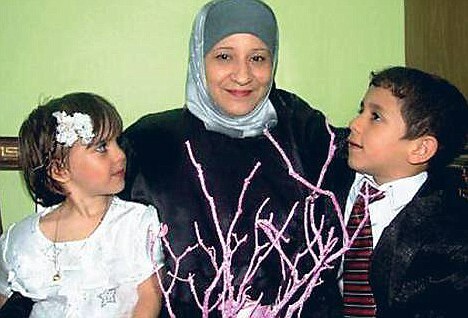 Khalid's family returned to Lattakia for the ceremony. Khalid, an only child, was born after Juma had been married for 20 years. During his wife's 'complicated pregnancy' Juma vowed that if the child was a boy he would have him engaged at the age of five and 'marry him to a woman of his choice at the age of 15'. Child marriages are condemned by international human rights groups. The UN recommends that countries adopt a minimum age for marriage of 18 for both sexes.